There are over 500 First World War memorials scattered across the country, in almost every community. Why did New Zealanders go to such monumental lengths to create them? It did not take New Zealanders long before they began putting up memorials to the First World War. Within three months of the landing at Gallipoli on April 25 1915 schools in Auckland, Waikato and Wellington planted trees in honour of their old boys and girls serving as soldiers and nurses. Within a year the first community memorial had been unveiled – at Kaitaia in the far north with an inscription in both English and Maori which remembered ‘our brave lads’ who had sacrificed their lives ‘in this terrible war’. Once the guns stopped on 11 November 1918, communities began planning memorials in earnest. Over the next decade over 500 communities throughout New Zealand would build memorials. In addition many churches, schools and businesses put up memorials or honours boards to their former members who had served and died. Sorrow of friends and relatives: Over 18,000 New Zealand soldiers and nurses died in the war. Each of these had at least six people to whom they had been very close – mothers, fathers, siblings, wives, girlfriends, children, lifelong friends. So at least 100,000 people mourned their loss intensely and everyone knew a few war casualties. Most of the dead were buried in foreign soil – in cemeteries in Europe or the Middle East, which were difficult to visit. Many soldiers had no known grave. Family and friends wanted a sacred place nearby, a kind of surrogate tomb, where they could visit and remember their loved ones. In the 1920s mothers and sisters would rub their fingers over their son’s name on the local memorial. Often parents of fallen soldiers led the campaign for a local memorial. Alfred Faulkner was a county engineer in the Wairarapa who lost a son and a nephew in the war. 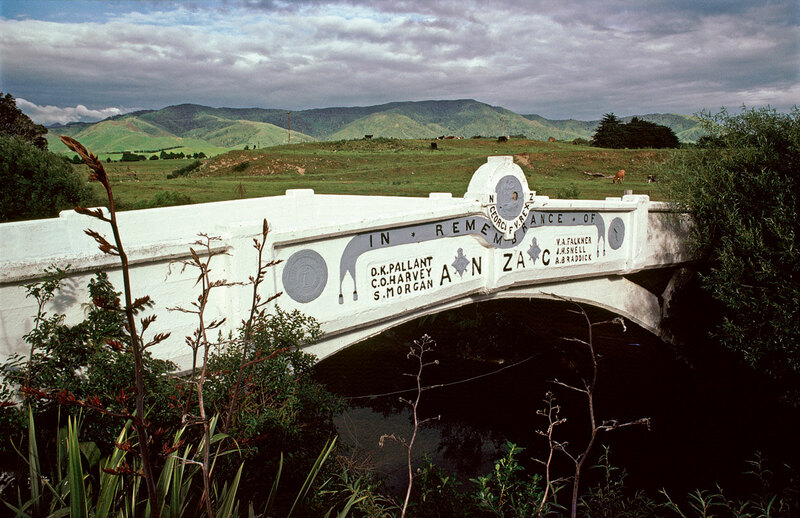 So he designed and built an unusual concrete bridge at Kaiparoro near Mt Bruce as a memorial. George Gould whose son had died in the war and who had lost six of his immediate family campaigned for 17 years before the magnificent memorial in front of the Christchurch cathedral was unveiled. Colonel Joseph Nichols had lost his son and three members of his immediate family. 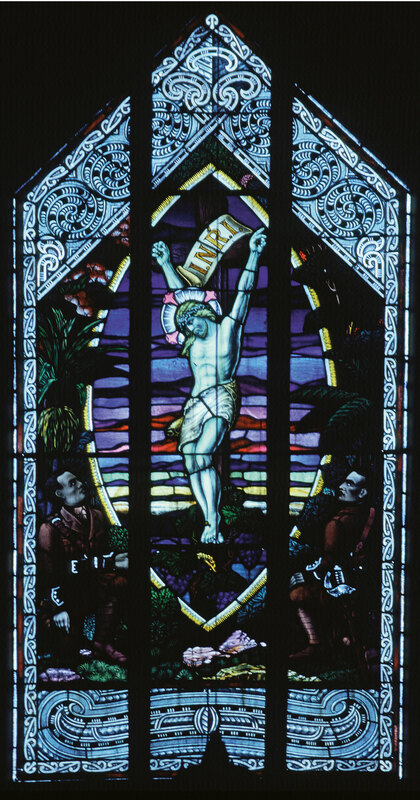 He arranged for two memorials – stained glass windows in his local church at Maheno as a family memorial and a stone monument topped by a field gun which stands in the paddocks of his former estate as the Kuriheka community memorial. Opened in 1922, this concrete bridge at Kaiparoro in the northern Wairarapa is one of the country's three First World War memorial bridges. It was designed and built by the local county engineer, Alfred Falkner, who had lost a son and a nephew in the war. Image courtesy of Jock Phillips and Chris Maclean. Pride: Many New Zealanders had much pride in the contribution which New Zealand soldiers and nurses had made to the British Empire in the war. They believed that through the soldiers’ efforts the country had come of age. A memorial was a celebration of national achievement. Lesson for the future: Some New Zealanders believed that the heroic example of the ANZACs provided an important example of public service for future generations. Some schools put up memorials at their entrance so that pupils would be inspired each day as they entered the school grounds. A focus for Anzac Day services: From 1921, April 25 was set aside each year as a public holiday to remember the services of men and women in the war. A memorial provided a place where the Anzac Day service could be held and wreaths laid to remember the fallen. 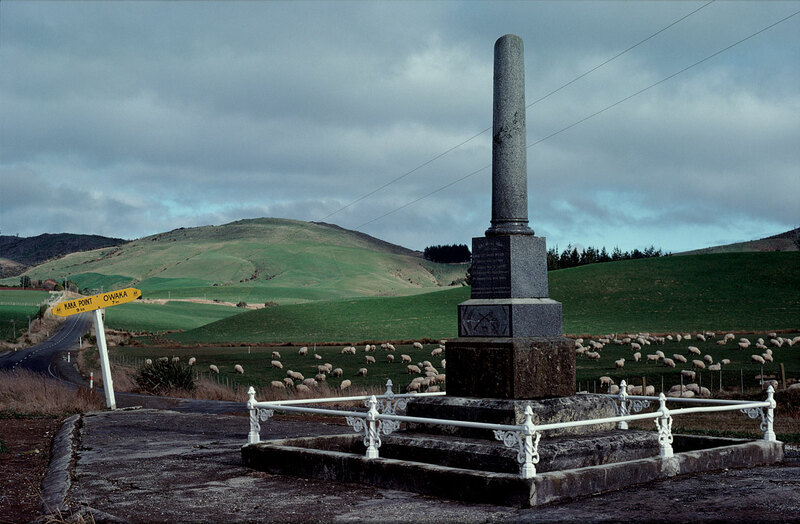 The Otago Peninsula Fallen Soldiers' Memorial was unveiled in 1922 on a site deliberately chosen to be widely visibile. Image courtesy of Jock Phillips and Chris Maclean. Prominence: Some communities wanted their memorial to be constantly visible to express its importance. So they placed their memorials on highpoints, as in Thames, Paeroa and Roxborough. 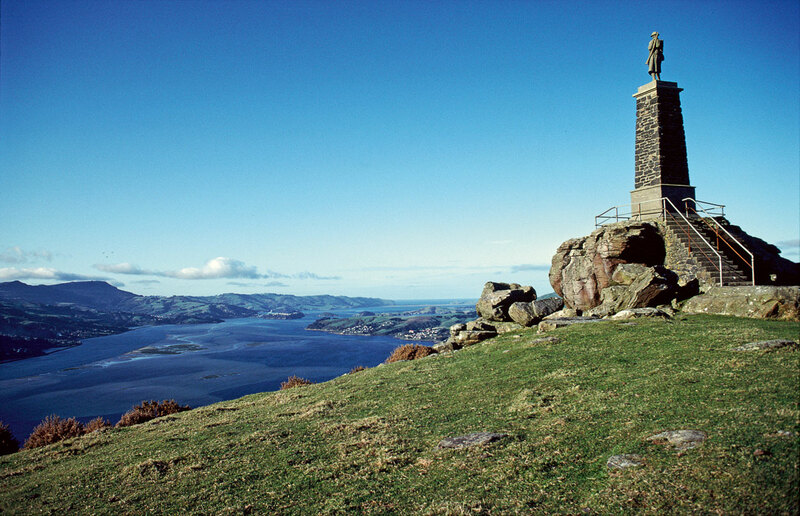 The memorial on the Otago Peninsula stands high up on a rock and can be seen from much of the peninsula. Central: Many communities wanted the memorial close to the centre of their town where it could be visited easily by grieving relatives. Sometimes in small towns this meant at major intersections. Larger towns often placed it in a central civic square as in Palmerston North. In Whanganui the first proposal was for a memorial tower on Drury Hill, clearly visible from the city. But mothers who wished to regularly visit and mourn their loss convened a public meeting to object. They wanted a memorial close to town. In the end the Durie Hill tower and a memorial in Queen’s Park, close to the civic centre, were both erected. A place for services: The site for the memorial had to be large enough to allow for the Anzac Day service. Symbolic site: To emphasise the memorial’s importance it was often placed close to or opposite the town’s most important public building, such as the town hall. Other towns put the memorial in a public park or garden because they believed the quiet atmosphere would encourage contemplation. A few communities chose the entrance to the local sports field or rugby ground, in part because they believed playing sports, especially rugby, had trained soldiers in physical strength and courage. The memorial at Glenomaru in the Catlins area of Otago is not broken. Rather, its shape was intended to symbolise lives cut off in their prime. The column was unveiled in 1920. Image courtesy of Jock Phillips and Chris Maclean. Useful memorials? After the Second World War most memorials were halls or sportsgrounds which assisted the community directly. Some people suggested this approach in 1918 and 1919, but the majority came to believe that a useful memorial disguised the idealism and self-sacrifice of those who had died. There were a few memorial halls and libraries. Hastings had a memorial hospital, and Auckland a memorial museum. But useful memorials were not common. Obelisks: The most common type of memorial was stone obelisks. They were a familiar style in cemeteries so evoked a tomb. Their flat faces allowed for inscriptions and lists of names. the ‘untidy soldier’ with his bootlaces undone and clothes dishevelled which was sculpted by a returned veteran, Frank Lynch, and appears at both Masterton and Devonport. Richard Gross’s marble soldier stripped to his waist and labouring with a sandbag which is in Cambridge. The magnificent portrait of a New Zealand soldier at Kaiapoi. This was sculpted by a Christchurch stone-mason William Trethewey who was also responsible for the memorial in front of the Christchurch Cathedral. 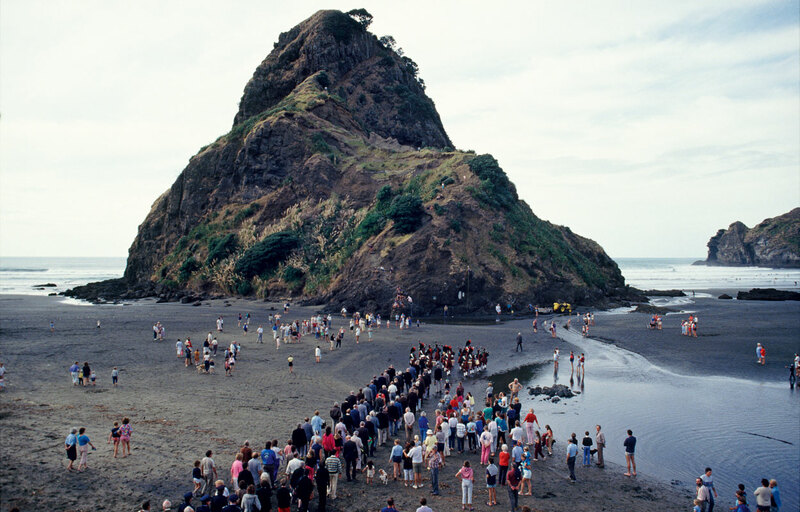 An Anzac Day procession makes its way to Lion Rock, Piha's war memorial. The service each year is held at low tide. Image courtesy of Jock Phillips and Chris Maclean. Natural features: Adopting natural features as a memorial was not common but was often effective. Cave in south Canterbury has a large boulder carrying soldiers’ names, while Piha placed its memorial plaque on the huge Lion Rock. The Anzac Day service is held there each year and the incoming tide washes away the wreaths. Female Figures: There are about 15 female statues as war memorials. Some are angels of death, others a personification of victory. The Palmerston North memorial is of a mother looking towards the battlefields where her sons lie. Arches and gates: There are about 30 memorial arches and 50 memorial gates. They were a common symbol of military triumph in Europe and allowed people to read inscriptions as they passed through. Crosses: There are only a few crosses as war memorials in New Zealand, although they were the most common form in the United Kingdom. Perhaps New Zealanders did not want to offend those in the community who were not Christian. Stained glass windows: There are many schools, universities and churches which have windows dedicated to their members who died in the Great War. St Andrews Church in Cambridge has fine windows portraying soldiers scaling the heights at both Gallipoli and Le Quesnoy, while the hall at Christchurch’s Arts Centre (formerly University of Canterbury) shows soldiers defending British civilisation from the dragons of ‘brutality and ignorance’. The window above the altar in the Ngāti Porou Memorial Church at Tikitiki. Image courtesy of Jock Phillips and Chris Maclean. Usually Māori were listed alongside Pākehā in local memorials, but there are some specific memorials to Māori. A few are to be found on marae such as Ōmāhu near Hastings, Te Rāwhiti in Northland and on Te Tokanga-nui-a-noho marae at Te Kuiti. At Tikitiki a beautiful church was built to the war dead of Ngāti Porou. There are also two impressive Māori monuments: the Te Arawa memorial in Rotorua which is topped with a statue of George V; and the tall obelisk at Pākaitore in Whanganui to local men which originally had soil from the main theatres of war buried in each corner. After a period of neglect in the 1970s-1990s when many memorials were left to decay, the new millennium has seen a renewed interest in remembering the First World War. Many memorials have been restored; and new memorials have been built which usually honour the dead of all New Zealand’s wars. Sometimes this has been in older communities which never had a memorial – such as Blackball on the west coast or Mangonui in the far north. Sometimes it is in areas which have seen huge population growth since the 1920s. An ambitious example is in south Auckland where an impressive memorial which includes photographs and participants’ writings on black stone was unveiled in the Manukau Memorial Gardens in 2010. The centenary of the First World War has added a new meaning and given new attention to New Zealand’s rich legacy of memorials. Where is the memorial located? Is it in a public or quiet place? What form does the memorial take? What do you think the symbols on the memorial mean? What do you think a memorial-making project would look like today?